Last week, friend and bigfoot investigator Will Robinson found several interesting impressions along the Sandy River, just east of Portland, OR. Will was fishing with a friend on private property owned by his friend's uncles. 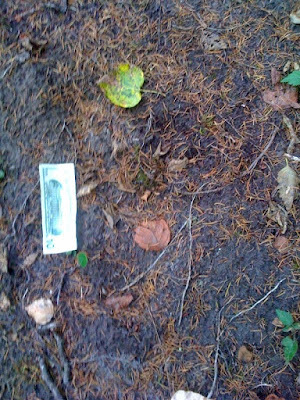 Using his cell phone and a $10 bill for scale, Will photographed two impressions and sent them to me for my opinion. Only one impression was in substrate that would record details of any sort. 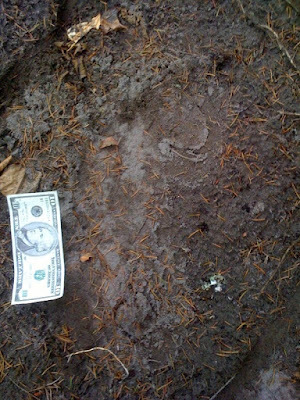 While one photograph shows little if any detail, the other shows clear toe impressions and some information on the shape and length of what could be a footprint of a sasquatch. Using fishing line, Will measured out the length of the impression and later determined it to be nearly 20 inches long. I have personally taken photographs of footprints in the ground only to discover that the photograph shows almost no details compared to what I saw in person. So, when I saw the detail in Will's photographs, I was excited and wanted to visit the location. Upon speaking to Will, I was even more excited to find that the impressions had an approximate depth of 0.25 to 0.5 inches: in other words, fully castable. The context of the footprint find was promising, too. The surrounding forest is either private property, or a designated nature preserve. It is only a mile or two to Gordon Creek, where I investigated an excellent sighting in July of 2008. It is also near to one of my Sandy River study sights, the Sandy River Project Site #2. As if that weren't enough, last spring there was an interesting rock-throwing event that occurred less than 150 yards from where the footprint was found. Will's fishing buddy was fishing at the nearby river beach with a few friends when out of the corner of his eye he spied a rock about the size of a man's head come plummeting down. He turned in time to see the rock splash into the water a short distance from him. Based on the angle from which it came in, and not even considering sasquatches to be real animals or even a possible source for this projectile, he and his friends judged that the most likely explanation for this unsettling event would be that somebody was dropping rocks out of airplanes. Right, that's the most likely explanation. 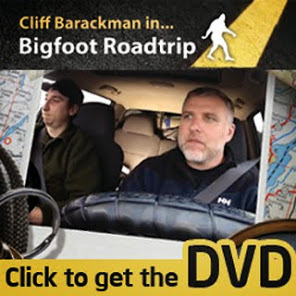 The lengths that folks will go to in order to not believe in bigfoots! Well... Neither Will nor his fishing friend told the uncles that the footprint was there out of fear that they would be heckled, and then the uncles would go and fake a number of other prints in the beach. However, in the intervening four days, one of the uncles took his ATV out on one of his regular patrols and drove right over the footprint, erasing all trace. That's 'squatching... You do this long enough, and you realize that it's often a series of bum-outs followed by short flurries of awesomeness. I try not to fret about such things. On a similar note, I have investigated reports where quads or ATV's have run over footprints before. I've ridden quads. They're fun. Watch where you ride, though. Don't tread on data, please.